We upgraded an internal tool, deployed using ClickOnce, to .NET 4.7.1 (net471). 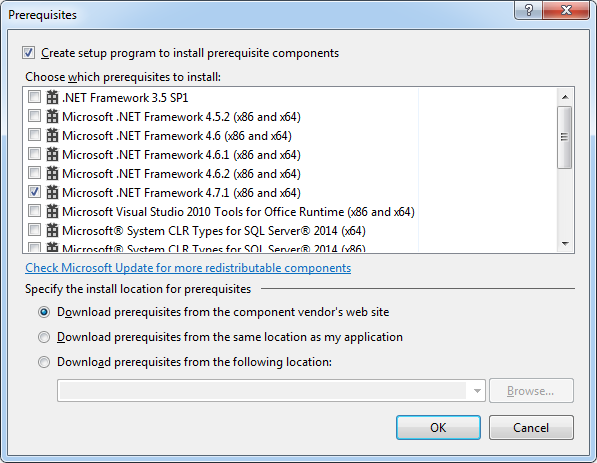 When using the Publish option in Visual Studio 2017, the prerequisites don’t provide an option for .NET 4.7.1. Before starting, make sure you have the Microsoft Framework 4.7.1 Developer Pack installed on your machine. Open C:\Program Files (x86)\Microsoft Visual Studio 14.0\SDK\Bootstrapper\Packages. Copy DotNetFX471 over to C:\Program Files (x86)\Microsoft SDKs\ClickOnce Bootstrapper\Packages. See also .NET Framework deployment guide for developers.